Q: President Mahinda Rajapaksa, it’s a pleasure to see you again. Thank you for receiving me and WION for this exclusive interview. I’ll start with India/China/Pakistan – the region. Sri Lanka is today steeped in external debt to China. The current Government under President Maithripala Sirisena is under tremendous pressure. It is slated to give China up to 80% stake in the port of Hambantota and a 99-year lease on 15,000 acres of land nearby. Your critics say that it is your Government that began the dependency on China, your supporters blame the present Government in Colombo. Either way, India is not happy. Who is more responsible? A: They say we are responsible and we say the present Government is responsible. Some even say India is responsible. We had decided to consciously re-orient our countries towards Asia, which, of course, means the two power houses India and China. We did this for more than one reason. Firstly, we identify ourselves as Asians and therefore we identify our destiny as part of that of the continent of Asia. Secondly, Asia is our civilisational and cultural comfort zone. Thirdly, we look to Asia to protect us and help counter-balance pressures on our nation’s sovereignty from outside the region. We continue to hope to benefit from the economic rise of Asia propelled by the growth of its two giants, India and China. But there was no dependency on China under my Government — I must tell you that. All projects were income-yielding. Repayment was commercially feasible. Take the Hambantota sea port. First, I went to India, and I requested them I want a harbour port here and asked whether they could please help us. But you know…the Indian way. You can’t blame them either because the private sector is involved and then there was red tape, etc. All in all, they were not prepared to accept because the (Sri Lankan civil) war was going on, not only the north and east, but even in other parts of the country. Then, I think in 2006, I went to China. There, I negotiated the port. They immediately gave it to me within that year. But it was a loan that we could afford, because we knew from the income we get that we can pay it back. We were not depending on them (China). It was a direct loan, for which we never gave them the port. After that and for the second and third phases, we negotiated with them on a Supply-Operate-Transfer (SOT) basis. But only for the terminal, not the port! And even in the terminal, they had to pay for the land. We never gave them land like this (the current Government). Unfortunately with this Government, it’s their approach. As soon as they came to power, they cancelled all these contracts, all these agreements with China and antagonised Beijing. Thereafter, of course everything changed. Now they are offering 15,000 acres – we never offered them anything like that. What they are doing now is — I would say, they are selling the country. Q: China is Sri Lanka’s largest trading partner and biggest investor. Even some Sri Lankans say that China is slowly colonising your country. You and the factions supporting you are yourselves protesting the Hambantota deal with China. And yet, your Prime Minister, Ranil Wickremesinghe is expected to initial the deal when he visits China in May. Colombo’s Port City Project too is steaming ahead. And through the docking of its nuclear submarines, China has already made it clear that it has larger, strategic interests in Sri Lanka and the Indian Ocean region. Is it too late to revert this process of near colonisation of Sri Lanka by China? A: There was no idea of colonisation in our time. China is a valued friend and a partner in development, that’s all. However, there is a significant difference between our approach and that of the present Government. The Chinese projects were negotiated by the last Government (ours) as per the structures I described. For Hambantota, it was a Supply-Operate-Transfer (SOT) arrangement only for the terminal and the land was leased to them. So there can be no talk of colonisation as such. But this Government has changed all those policies. That is why all this is happening now. Q: To decimate the Liberation Tigers of Tamil Eelam (LTTE), against whom there was a brutal civil war for 30 years, your Government received arms, training and even aircraft from China and Pakistan. Did you ask India to help at the time and if so, how did New Delhi react? A: But they helped us! We didn’t have to ask! Because I was fighting your war, India’s war, not my war, actually. The LTTE killed your Prime Minister, Rajiv Gandhi and so many other people in India and on your soil, not ours. So in that way, it was not only my war, it was an Indian war, it was a humanitarian war. India helped us in every possible way. We didn’t want to publicise it, tell the press too much. And not only China and Pakistan, even the British and the Americans helped us. Q: Pakistan is a hotbed of Islamist terrorism, mostly targeted at India. The Maldives too, have been home to the maximum number of Islamic State recruits in South Asia and is being rapidly influenced by Saudi Wah’abi Islam. Bangladesh has seen IS terror and sleeper cells. Your Justice Minister recently said that 31 “elite Sri Lankan Muslims” had joined the IS too. Given all this, it’s surely better for Sri Lanka to improve relations with India, than ignore the dangers from Islamist terrorism in the region? A: We believe in improving relations with all countries in our neighbourhood, this I must tell you. Both India and Pakistan have helped us as best as they can, we have traditionally been friends of both. And that friendship has not been mutually exclusive and contradictory, that is, friendship with one has not been at the expense of the other. We are mindful of the sentiments of our citizens of Islamic faith. You will remember that our former PM, Mrs. Sirimavo Bandaranaike was a close friend of the Islamic world. Of course, we have only one neighbour, India. It’s a subcontinent and where our Tamil citizens have cultural, linguistic and civilisational links. For all those reasons our relationship and friendship with India is quite special. Even unique, I would say. Q: Mr. Rajapaksa, you had promised to bring about a solution to the demand for Tamil autonomy in your Northern and Eastern Provinces. India insists on the implementation of the so-called 13th Amendment to the Sri Lankan Constitution which Rajiv Gandhi’s Government had co-authored and both parties signed in 1987. Thirty years on, is it the best solution? A: I won’t say it’s the best solution. If it were, the problem would have surely been solved by now. We must remember that all communities must get together to give a solution. You can’t come up with one solution only to satisfy one section or community. We have to satisfy all. Q: The fishermen’s issue and the Kachaithivu agreement make headlines in both India and Sri Lanka every day. What’s at the bottom of both and how can they be resolved once and for all times? A: Fishermen only follow the fish, they are not worried about borders. But it is our duty – that of Delhi and Colombo – to stop this, we must have the political will to do so. Indian fishermen come here and deplete the entire seabed of fish by using bottom trawlers. So this must stop. And New Delhi must have the political will to stop it. Q: You had accused India, specifically its Research and Analysis Wing (RAW) of engineering your election defeat in 2015. How so? A: (laughs) You know, I don’t want to go into the past. What’s done is done. It’s a new page now. Q: If you were to return to power – either with the Sri Lanka Freedom Party (SLFP) faction that supports you or some other new party, would you want to recalibrate your relationship to India which was very tense during your years in office? A: Frankly, I think both my Government and this Government and may I say even earlier governments like that of President J.R. Jayewardene have learned lessons in geopolitics and economics! No Sri Lankan Government can fail to recognise that Sri Lanka cannot afford to antagonise the two Asian giants – China and India. We have learned our lessons by now. So it’s in our national interest to very carefully balance and maintain equilibrium between the two. Q: A report in The Hindu suggests that you and your brother, former Defence Secretary Gotabaya Rajapaksa have fallen out and that Ram Madhav, Indian PM Narendra Modi’s special man for Sri Lanka, is involved in engineering some sort of a political arrangement which will include your brother and suit Indian interests. Can you comment on that report? Q: What is your personal equation with PM Modi? You have met him several times, including at his own inauguration. Would you have any anecdotes to narrate? A: I regard myself a friend of your PM Modi. I admire what he has done for your country, India. And his international prestige. I really like the way he has harnessed the support of the Indian diaspora in a way I couldn’t! I admire his patriotism and his drive at modernising India. Yes we admire him, there’s no question. Q: Earlier this year, several former “rehabilitated” LTTE cadres were arrested for being part of a diaspora-hatched conspiracy to kill moderate Tamil leader M.A. Sumanthiran. Two years ago, three former Tigers including one “Gobi” were chased and gunned down and caches of weapons found in Sri Lanka’s Northern Province. The Liberation Tigers have regrouped outside Sri Lanka. Does all this mean that the rehabilitation program started by your Government has proved to be a failure? A: Not at all. Our rehabilitation effort was successful and humane. What has been a disaster is the weakening of our security forces and our safety network in the former conflict areas. Weakening them has been a deliberate policy of the present Government. I fear that disaster is looming. When we released them – about 12,000 people – some were rehabilitated fully, then underwent the entire course. Then there were those who had taken only half of it. Finally there were others who somehow managed to escape that rehabilitation program. The LTTE diaspora is collecting money and they are powerful. So it is essential to have a good security network. Our intelligence networks must be strengthened. Instead, they have weakened it, because they are listening to the LTTE diaspora. Q: But if the rehabilitation program was successful, then these stories of an LTTE resurgence are surely just politically-motivated rumours? A: No, they are not. They’re probably the tip of the iceberg. Q: So you feel the problem is much larger? Q: Former Tiger Karuna has formed the Tamil Freedom Party in Batticaloa, another former Tiger the “Rehabilitated Liberation Tigers Party in Trincomalee”. “Tamil freedom”, “Liberation Tigers” – surely no Election Commission in united, post-war Sri Lanka can and should accept such party names? A: Well, I support and encourage Karuna. He took a personal risk by coming into the mainstream and that cost him his brother Reggie’s life – he was killed by the Tigers. Now if Karuna’s forming a political party, I wish him luck. I don’t know enough about the other party you mention. But rehabilitees must be able, free to start political parties. We must encourage them to come into peaceful, democratic, non-separatist politics. Q: But surely with better names? A: Yes, I suppose so… I think the Election Commissioner will advise them. Q: You are widely credited – even by your detractors – as the first Sri Lankan president to bring the 30-year civil war to an end. Corruption charges against your family persist now. And yet, your popularity seems on a phenomenal upswing. A new party has been formed, it is asking you to leave the SLFP and lead it instead. 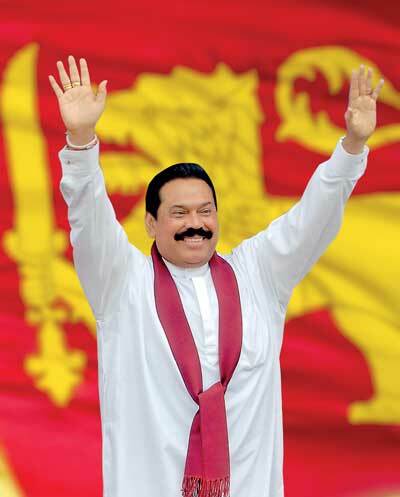 Either way, will the next election see the return of Mahinda Rajapaksa into the fray? A: Mahinda Rajapaksa never left the fray. As long as my country, my nation, my people are in danger and need me, I remain in the fray. Q: So whether as PM or President, you will come back, in whichever role? A: I must tell you that patriotic politics is not a job. It is my life’s vocation.